Electric guitars can be customized in countless ways. Whether you're altering the sound of the guitar or the look of the guitar, it's easy to make your guitar an individualized instrument that's yours and yours alone. As long as there have been electric guitars, there have been customized electric guitars. Regardless of whether your custom features are simple or complex, modifying your instrument to your unique specifications is great way to make your mark in your music world--no matter how big or small that world is. Put some stickers on it! The easiest way to customize an electric guitar is to change the way it looks by decorating the guitar body. Bumper stickers, flag stickers, music store stickers, band stickers, gas station stickers, restaurant stickers--since the early days of rock 'n' roll, these have adorned the electric guitars of players all of the world as badges of honor. Some players opt to put every sticker they find on their instrument. Guitarist Johnny Greenwood of Radiohead has played a telecaster with a Honda motor car sticker on the pick guard throughout his career - although the original decision to place the sticker on the guitar was no doubt done without much thought, the guitar has become instantly recognizable to Radiohead fans as Greenwood's. Whether your using 1,000 stickers or a handful--they're a great way to make a mark on your instrument and help make the guitar uniquely yours. Throw some paint around. Another way to individualize an electric guitar is with paint or permanent marker. If your guitar is black, add some color. If it's colorful, write something on it. The available creative options are as varied as the music options inherent in the instrument. You can also clip off the guitar's strings and remove the plastic pick-guard using a screwdriver. Once the pick-guard is detached from the guitar, you can paint it any color you choose. Many electric guitars are sold with a white pick guard--painting this portion one or many colors is a great way to separate your instrument from the masses. In addition, the pick-ups on some guitars have removable covers that can be custom painted or replaced with a different color plastic. Use a plastic primer or a spray paint designed for plastic when painting the pick-up covers or pick guard. Change out your pick-ups. The installation of custom pick-ups will change how your electric guitar sounds when amplified. Electric guitar pick-ups can be purchased at your local guitar store or on-line. The sound of the guitar can be made "fatter," with a large/louder tone, or specified to specialize in single-note soloing. Some pick-ups are designed to bring out the choral effects of rhythm guitar chords. Pick-ups can be removed using a screw driver after removing the pick-guard. Use wire cutters to remove the electrical connections of old pick-ups and a soldering gun to adhere the lead wires of the new pick-ups to the pick-up receiving wires of the guitar. Buy some effects! Another way to customize your sound without tinkering with your electric guitars internal make-up is to use effects. Electronic guitar effects use computers to alter the sound of the guitar before it reaches an amplification system. Effects can be foot-operated "pedals" or larger, rack-mounted units. 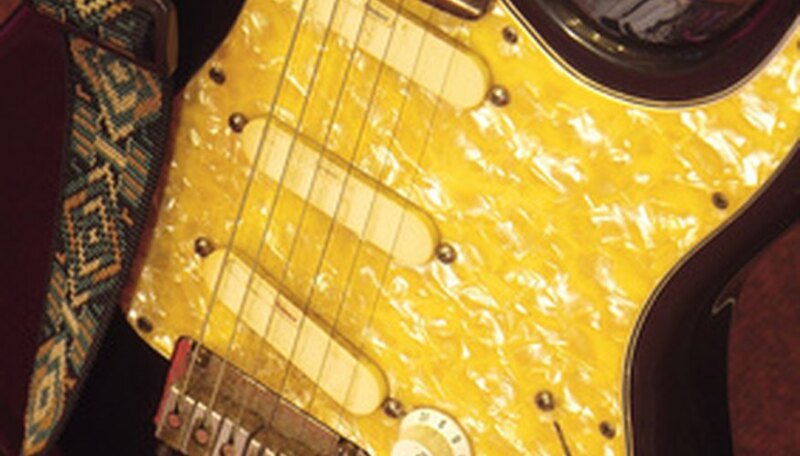 If you're looking the echo-effects of Eddie Van Halen, the warm blues tone of B.B. King, the warbly noisiness of Sonic Youth or the punk rock crunch of Rancid, electric effects are where you should look. Distortion pedals are probably the most widely used electronic effect for electric guitars. Wah-wah pedals are also a common electric guitar effect. This pedals gives the swooshing "in and out" sound often implemented by funk guitarists and rock soloists. There are hundreds of electric guitar effects available at music stores and on-line. Remember the amp. Your electric guitar's amplifier is an important part of customizing your sound. Amps of different sizes, brands, age and technology all delivering varying tones. The tone of each amp can be altered as well, not only by adjusting the equalization channels but my adding gain for distortion or reverb for echo. Make sure to do some research before venturing to take apart your guitar for painting. You'll want to make sure you can reassemble it again so it will play effectively. Blank pick guards and pick-up covers can be purchased at music supply stores. Those without an interest in taking apart the guitar themselves can always paint parts and then have their local guitar repair person take care of assembly.